I’ve never been one to particularly enjoy going out of my comfort zone. So when several people suggested that I somehow contribute to Bernard’s weekly reflections I was not an instant fan of the idea. Nonetheless, it is with great joy (and slight nervousness) that I write this special ‘guest’ column for Proposal to Marriage. I decided to pick a topic that I felt I could offer a little more insight than Bernard – the experience of finding a wedding dress. After spending the better part of the last decade searching for Mr Right I suddenly found myself in the unfamiliar position of being able to say that I had found him. Now what? Well having been involved in quite a few weddings as a bridesmaid, I knew there would be lots of jobs to get done and that the planning would be a potentially time-consuming and even stressful process. I was aware that many bridal stores say it takes 4-6 months for a dress to arrive, and having only 7 months from the date of our engagement to the date of our wedding, I didn’t want to waste any time. Within a few weeks of getting engaged, my mum and I set out for a morning of dress shopping. Walking into the first shop was like an out-of-body experience. I felt like some sort of imposter, like a little girl playing dress-up. My understanding was that ‘brides’ wore wedding dresses…I was just ‘Jane’. I remember looking at another young lady in the store and thinking ‘wow, she probably feels just like me’. 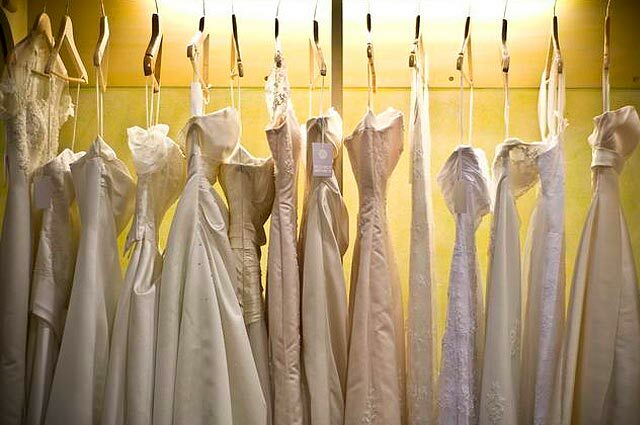 I might be totally mistaken, but I think there is a certain special connection that exists between the women trying on dresses in a bridal store. Seeing someone else in a white gown, even though their taste and personality obviously differed from my own, I knew that we shared something in common – we were both searching for a dress that we were to wear on our special day. And not just any dress but ‘the’ dress. This led me to ponder what a wedding dress really represents and why it is traditionally so important to a woman. It was funny when looking at hundreds of dresses on manakins and flipping through display books that I thought so many of the dresses seemed quite hideous or simply ‘not me’. However, the common theme was that they were generally expensive, elaborate and white. I guess the diversity in designs indicates that the dress should reflect something of the person who wears it. Some would believe that all the fuss about the dress is just an excuse for a woman to feel like a princess for a day. Others might say that the dress is an expression of individuality. While I accept these ideas to some extent, my main focus is the more traditional notion that my wedding dress indicates a transition from childhood to adulthood. The white colour is a symbol of the innocence and purity of that childhood. I actually try to use this understanding as a type of motivation in striving to live out purity of mind and heart. I want to wear a white dress on my wedding day because it represents something deeply beautiful and meaningful not just because it’s the done thing. I do hope that the continuing trend of choosing a white dress is some sign, even in today’s modern culture, that people still believe what it traditionally represents is something of great worth. To cut a long story short, I ended up trying on a number of dresses over two separate shopping trips with my mum. Unfortunately, once I had a picture in my mind of what I wanted nothing seemed to be right (not to mention the less than ideal price tags). So I decided to take a slight risk by purchasing a dress online. My rationale was that I knew people who had done it successfully, I would be able to save a significant amount of (my parents’) money and if I didn’t like it I would still have some time up my sleeve to return to the bridal stores or even ask a dressmaker friend to make one for me. When the dress arrived I quickly realised it was NOT the dress that I would be wearing on my wedding day. My mum and I pretty much got straight in the car to drive to a bridal shop. I gradually worked myself into a state of panic knowing that the wedding day was now only 4 months away. Amazingly though, God had things under control. A quick prayer to St Anthony along with the help of a lovely bridal assistant – who made no comment of me ‘leaving things too late’ – was all that was needed. One hour later I had found ‘the’ dress! Posted in Uncategorized and tagged bridal store, engagement, marriage, proposal, purity, shopping, wedding, wedding dress. Bookmark the permalink. God is good like that. I had so many last-minute seeming disasters with my wedding that eventually just fell into place! Sorry the buying dress online thing didn’t work for you… it worked amazingly for me – what a leap of faith! Although it took some wonderful work from my private seamstress (aka my boss!) to do some minor modifications to the waist and to enable the dress to be bustled! We share the same values though – I chose a dress appropriate for God’s house and for the significance of my new status in life so to speak. And it was perfect. Glad you found “the” dress. Everything else will continue to fall into place until the big day with God’s wonderful help! Wanted to welcome you to the world of “joining” your husband in his (and noiw your) technology portion of the journey. And by the way, you have done a great job. Thanks for sharing.